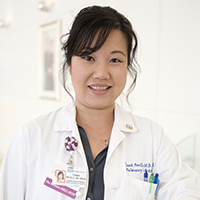 Dr. Thanh Neville obtained her medical degree from the David Geffen School of Medicine at UCLA in 2005. She also completed her residency in Internal Medicine and subspecialty training in Pulmonary and Critical Care at UCLA. She subsequently obtained her Masters of Sciences in Health Services from the UCLA School of Public Health. She joined the faculty at UCLA in 2012 and is currently an Assistant Professor in the Division of Pulmonary Critical Care. Dr. Neville sees general pulmonary patients in the outpatient setting as well as attends in the Medical Intensive Care Unit. Her research interest is in improving the quality of care at the end of life in the ICU.